In the usually silent town of Jorvik, things are beginning to happen. The new arrival of the city girl, Lisa, has started something that is both frightening and fantastic. Four girls from school form a special friendship that is reinforced in their common interest in horse riding, and with the guidance of Mr Herman, who runs the Jorvik stables, they start to realize that their connection maybe is predicted from long ago. The Dark Core Corporation is the biggest company in Jorvik and is performing massive drill operations outside the coast and the girls start to wonder what the real goal of the company is. Lisa, the newcomer, quickly becomes friends with Linda, Anne, and Alex, and decides to pick up her old passion of horse riding when she meets a special horse called Starshine – a white horse that has the ability to communicate with Lisa. Linda is an ambitious girl that is torn between the duties of school and the time and energy she spends at the stable. While doing research for a school project, she discovers strange things about the history of Jorvik, the Dark Core Corporation, and most of all, a man called Mr Sands. Mr Sands seems to be running the Dark Core’s darkest errands and pictures showing the man from almost a hundred years ago chill the girls to the bones. Anne is a well-off girl with a slightly arrogant personality, even though she has a heart of gold. She decides to help Lisa and the other girls when it turns out that the horse Starshine has been kidnapped from the stables. Alex is a happy-go-lucky girl who has grown up a single girl with several brothers which has made her tougher than most other girls. She also decides to help when strange things are starting to happen at the Jorvik Stables. Starshine himself is a mysterious horse. He discovers that he can communicate with Lisa and he realizes that she is the only one that can help him from the dangers he is in. 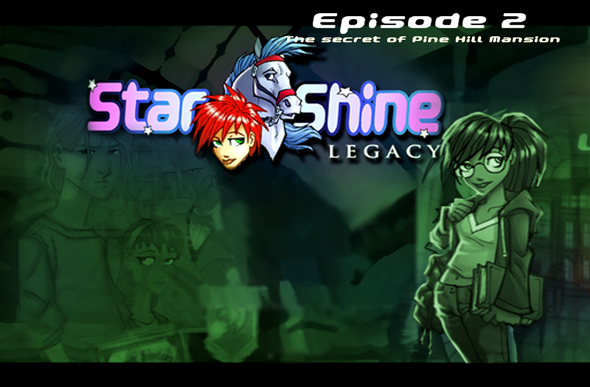 Lisa finally manages to rescue Starshine and also realizes she has powers within her she didn’t think possible. With Starshine saved, many questions go through the girls’ heads. Why is there a supernatural link between the girls and how can Lisa communicate with the horse Starshine? What is the real objective of the Dark Core Corporation, and who is really the shady Mr Sands?